Many companies claim to be steeped in ‘tradition’. But there is hardly any company more entitled to boast this signet of consistency, experience and quality than the paper manufacturer Hahnemühle which was founded in Dassel in Lower Saxony in 1584. What initially began with handmade writing paper was later complemented by art paper and, more recently, digitally printable FineArt inkjet paper invented by the company Hahnemühle. But the traditional art paper is still being manufactured according to old recipes from high-quality cellulose and pure spring water. 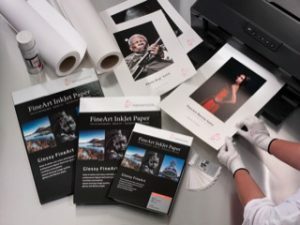 The paper technologists at Hahnemühle are reliable partners of artists, technicians and scientists. They manufacture exactly according to their customers’ requirements, continuously optimise the paper together with them, and develop products for new market segments. Their motto has always been “quality not quantity”: With an annual production of about 3,000 tons, Hahnemühle sees itself more as a manufactory than a factory. Production has taken place at the same location for 430 years – with the highest quality and innovative spirit created from tradition.